Attention: Coaches, Therapists and Wellness Professionals! Building your client base does NOT have to be a struggle; it can be easy, enjoyable and fun … AND aligned with your values. 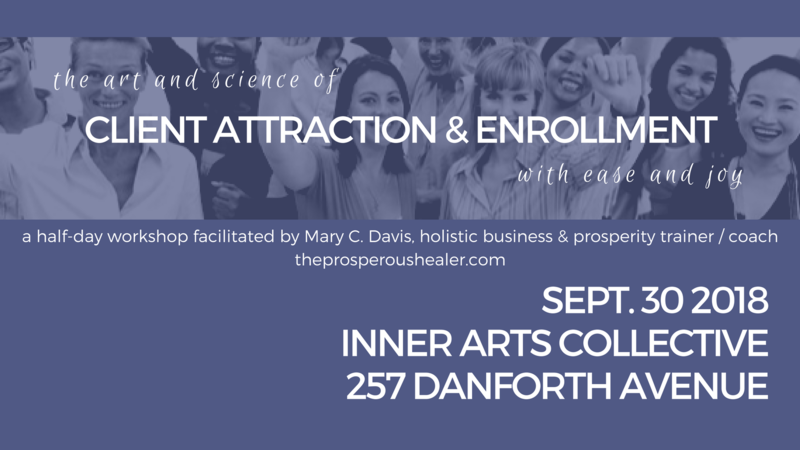 Come and learn proven, practical, effective strategies to engage and enroll clients, and how to use these strategies in aligned, inspired, creative ways. b) have been operating a wellness practice/business for a while, but want to have a more stable client base and more consistent, growing revenues. Linda: Tell us a bit about your own story of burnout and recovery. Mary: First, I just want to say that I think recovery is an ongoing process, not a destination. I am still very much on this continuous journey of learning how to take care of myself and allowing myself to deepen into greater levels of well-being. That being said, while I’ve touched burnout many times over the years as a business owner, each experience has been shorter and less intense and has helped me learn how to take better care of myself and develop healthier business practices and a healthier business model. I’ve made progress! The deepest level of burnout I ever experienced in my life came almost 20 years ago when I was working as a senior fundraising executive at a major teaching hospital. Up to that point, I had played a leadership role in raising over $30 million for the charitable institutions for which I’d worked. Yet, I felt empty, unfulfilled and inadequate. I was stuck in a pattern of driving myself to do and achieve more…never quite believing that I “measured up.” Not only was I physically burnt out, I was mentally, emotionally and spiritually, as well. My adrenals were totally shot, and I was stressed, exhausted and unhappy. That experience of burnout led me to seek well-being in a way I had never consciously sought it before. With the help of fabulous wellness professionals, therapists, healers, coaches and mentors, I developed a stronger understanding of and appreciation for wellness – what it involved and what I could do to support my own well-being. I was passionate about learning and applying everything I could about holistic, mind-body-spirit healing. And, as a student of my own well-being, I’m still learning! What I do know, for sure, is that when I prioritize my own well-being in my daily routine, in my business model and in the way I develop and operate my business, I thrive and my business thrives. I’m in that “sweet spot” of balance. Linda: What is the first thing you recommend to someone who has burnt out from their business model? 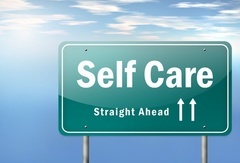 Mary: The first thing I recommend is to make self-care a non-negotiable priority. This may be obvious to a wellness professional, but those of us who are in service-oriented professions, even in the wellness arena, can inadvertently put our own well-being on the back burner sometimes. The myth that we have to work hard, struggle and sacrifice ourselves in order to help others and to succeed is a tenacious story that is very active in our collective psyche. So, if you need to take time off, do it and unhook from your business completely. Tend to your physical, mental, emotional and spiritual needs. Rest often and ensure you get extra sleep. Also, support your adrenals through supplementation, diet, hydration, etc. It’s a good time to go to see your own naturopath or holistic nutritionist, if you haven’t been for a while. Even if that’s the modality you practice, it’s hard to be objective about ourselves and our own well-being sometimes. If you need psychological/emotional support, see a counselor or therapist (even if you’re a counselor or therapist yourself). Go on a yoga or meditation retreat (even if you’re a yoga or meditation teacher yourself). The bottom line is that we can’t see clearly and make wise decisions for ourselves and our businesses when we’re burnt out. We can only truly build thriving businesses from a place of deep self-care, and this self-care has to be built into our daily routines, our business models and the way we operate our businesses. We can’t serve others in a healthy way coming from deprivation and depletion. Once you have sufficiently replenished yourself, if you don’t already have a business coach, I strongly recommend that you hire one as part of your commitment to your well-being and the well-being of your business. A holistically-oriented business coach will be able to support you mentally, emotionally, spiritually and practically as you continue to develop your wellness business. This person can help you to design and operate your business in a way that nurtures, focuses and optimizes your energy and resources. This will, ultimately, enable you to shed the burnout business model and allow your business — and you — to thrive with ease and joy. Thanks to Linda Dessau for a great conversation and a valuable new piece of content for my blog! www.theprosperoushealer.com for Mary’s free success guide, Attract Clients and Money with Ease and Joy and to learn more about The Prosperous Healer’s Path™ Business Success Program. 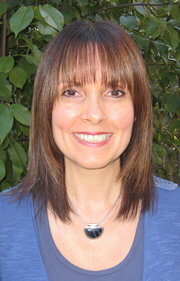 Linda’s website at www.contentmasteryguide.com for her free Four-Step Wellness Blogging Plan and to sign up for her upcoming webinar, Write Less, Earn More. © Copyright 2017 Mary C. Davis, ANAM TURAS. All rights reserved. If you like this post, please click the “like” button below and share it with your friends. Thank you. Also, feel free to submit your thoughts about this topic in the form below. I’d love to hear them! Linda: What is a burnout business model? A burnout business model can be characterized simply as one that attempts to attain income goals through an unsustainable expenditure of time, energy and resources, leading to burnout. all of the mental and emotional issues that play a role. while marketing, enrolling and seeing clients, you’re still doing tasks that need to be delegated to others, such as bookkeeping and administration, and do not have automated systems and processes. Linda: You talk about the challenge of walking a “path of balance” between learning and applying external business-building principles and strategies and tuning into and following your own inner guidance. How does being unbalanced with this contribute to burnout? Mary: I know from my own direct experience and from witnessing clients moving through this, how we can get caught in a bit of a mental and emotional, either/or “polarity loop” with these approaches as we build our businesses, that can really drain us energetically. We can bounce back and forth between extreme ways of approaching the development of our businesses. For example, we may spend hours learning and applying all the latest business-building techniques, mimicking what others are doing, without connecting with our own inspiration and guidance. Then, we may dismiss these techniques if they don’t deliver what we’re expecting them to deliver, within our timeline, and go to the other extreme of only relying on our own perspectives and instincts. However, these perspectives and instincts can be clouded by conditioned ways of thinking and limiting programs that prevent us from accessing our deepest wisdom and inspiration. This vacillation, and the inner struggle that comes with it, typically results in feelings of depletion and burnout mentally and emotionally. When we clear ourselves of the inner debris that contributes to this unbalanced way of being, we can reconcile the polarity loop between these extremes and act from a still point within ourselves. We’re able to balance learning and applying external business-building principles and strategies with tuning into and following our own inner guidance; they support each other, rather than being mutually exclusive. In my experience, that’s the sweet spot or place of power for building a thriving business, with ease and joy. visit Linda’s website at www.contentmasteryguide.com for her free Four-Step Wellness Blogging Plan and to sign up for her upcoming webinar, Write Less, Earn More. I know the lyrics to this 1972 song by Johnny Nash are a bit corny. Yet, my inner Pollyanna feels so darn good when she hears them; you’d think she had just come upon the land of perpetual rainbows and unicorns. Corny or not, the message of these lyrics is a powerful one for us “innerpreneurs”. Relating this to my own experience, I know that I can’t see “clearly” when I’m mired in painful thoughts and feelings that I’m ignoring, denying or suppressing. My journey has been one of learning how to witness — be present and accepting — of the “dark clouds that had me blind” and being really gentle, yet lovingly honest, with myself. It is through this avenue of cultivating compassionate mindfulness that I’ve been able to see more clearly and express myself more fully and authentically through my work, experiencing more of those bright, sunshiny days. This has also been accomplished through committing to the outer work — to actions that support clarity and movement, enabling me to create a thriving and growing business. Business visioning and planning have been integral to this. 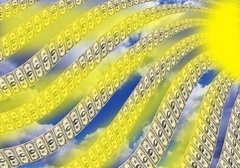 Sometimes, we put the deep inner and outer work required to create sustainably prosperous businesses on the back burner. We procrastinate and/or get caught up in the “busyness” of our lives and businesses, going from one thing to another, with a very vague picture of what it is we’re attempting to create. As a result, our actions become uninspired, inefficient and ineffective, and our businesses stagnate. We stagnate. To launch the New Year with momentum, I invite you to carve out some time, in the near future, to envision your business over the next twelve months. Set the intention that you’re going to “allow” clarity and give yourself the time and space you need to see clearly and develop your business. My clients are “cultural creatives” (a term coined by sociologist Paul H. Ray and psychologist Sherry Ruth Anderson); they are thought leaders, on the leading edge, who value health and sustainability. They have a burning desire to foster well-being in the world. I call them “healers”. Typically, they have a plethora of ideas circulating around in their heads. The inspired business visioning/planning process I facilitate my clients through provides the clarity and structure they need to focus their creative energy and put their ideas into action effectively and efficiently, generating the results they desire. Without this process, their energy is often scattered, mis-directed and diluted, creating ineffective actions and minimal and/or undesirable results. The reason for this is because operating without a business vision/plan is like showing up at the airport to fly somewhere without knowing where you’re going. It’s like going somewhere you’ve never been without a map. On a certain level, this may sound spontaneous and fun. However, when it comes to your business, having no map or direction can ultimately take the fun, spontaneity, creativity and prosperity out of your work. If you don’t know the general direction you’re going in, you’ll either get lost or it will take much longer than necessary to get anywhere. And, it will dampen your enthusiasm and joy. Being unclear about your business is a form of self-sabotage. If you find yourself resisting the process of business visioning/planning, explore the beliefs, thoughts and feelings creating this resistance and use your favourite clearing tools to transform these patterns. What beliefs, thoughts and feelings am I holding about creating a business vision/plan? What’s the predominant fear I have regarding getting clear about my business? What’s the pay-off for me staying in a place of vagueness and ambiguity about my business? 1. Get clear about your income goal for 2017 and write it down. 2. If you haven’t done this yet, get clear about who you serve (your authentic community – a defined group of people), what their core challenge is and the core benefit you offer through your work. 3. Get clear about your offerings and how they relate to one another and your community’s core challenges. 4. Get clear about your prices and sales targets. 5. Get clear about your relationship-building (i.e., marketing) activities and how you’ll invite prospects to become clients/customers (i.e., sell your services/products). A healer’s consciousness often resides predominantly in the intuitive, right hemisphere of the brain. This is wonderful for healing work, creativity and inspiration. Yet, manifesting in the physical world requires an integration of both the right- and left-brain hemispheres – the intuitive and the logical, the feminine and the masculine, the yin and the yang. A coaching client of mine had a breakthrough with this when she realized that the inspired business planning process I was taking her through was essential for bringing the prosperous business she desired into physical manifestation. Although initially a bit resistant to the process, she came to recognize that the structure of a business plan is necessary to channel her creativity and energy. She now sees her inspired business plan as a container – a sacred container – for her work. By having the courage to get clear and commit to that clarity, you, too, can create a sacred container for your business that will bring you prosperity and a bright, sunshiny year in 2017. To gain the clarity you need to attract clients and have a stellar year in your business in 2017, enroll in The Prosperous Healer’s Path™ Business Success Program. I’ll help you develop your own Inspired Business Vision and Plan and take inspired actions that will bring you powerful results. © Copyright 2011-2017 Mary C. Davis, ANAM TURAS. All rights reserved. © Copyright 2015 Mary C. Davis, ANAM TURAS. All rights reserved. If you like this audio, please click the “like” button below and share it with your friends. Thank you.